Autofolder is ideal for large mailrooms, associations and offices. High-speed machine automatically feeds and folds a stack of documents up to 8-1/2" x 14" at a speed of up to 9,000 sheets per hour. Electronic controls automatically pre-set letter, legal and A4 folds with a total of six pre-set fold types with the option of electronically adjusting the fold tables for custom folds. Use autofolder to create six different folds: letter (letter fold cannot be done with 8-1/2" x 14" documents), half, z-fold, double parallel, right-angle and baronial. Enhanced precision paper skew adjustment assures exact folding. Folder handles sheet sizes from 3-1/2" x 5" to 8-1/2" x 14" and types from 16 lb. bond to 70 lb. index. Feed table capacity is 150 sheets. Conveyor exit table makes convenient, easy-to-handle stacks. 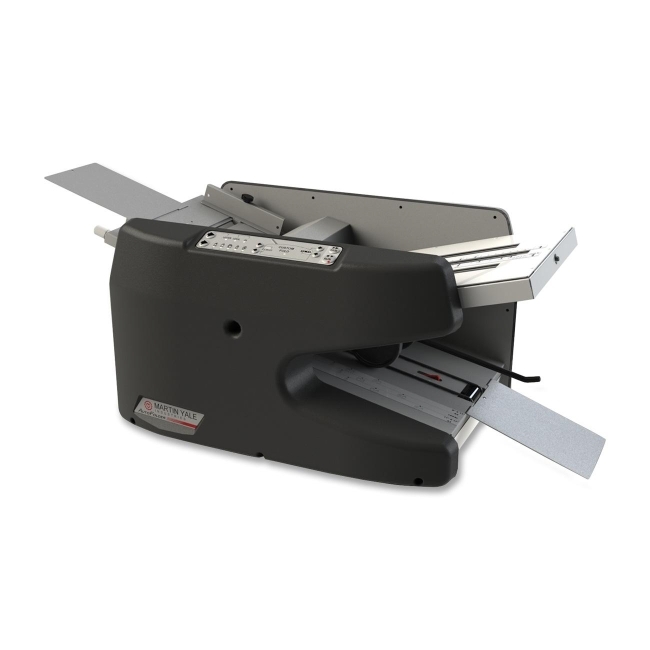 Electrical autofolder also features removable fold tables, stacking wheels, self-centering paper guides, auto jam detect and auto shutoff.